In Pontoon, a natural 21 consisting of an ace and a 10-point card is called pontoon instead of blackjack. The dealer always hits on soft 17. You, the player, cannot stand until you have at least 15 points or 5 cards. You can split any pair for a bet equal to your ante, and any two-card hand totaling 21 after a split is considered pontoon. You can re-split once, giving you up to three hands to play simultaneously. You can double down on any cards, even after a split. Because the dealer’s cards are both face-down you cannot buy insurance, and there is no option to surrender. The highest hand is a Pontoon, but a Five Card Trick – a hand with 5 cards that is not bust – beats any other hand. The maximum allowed wager in RTG Pontoon is 250 Euro/USD/GBP (minimum is 1). You make your bets using a combination of chips, which come in 4 denominations for easy betting. Pontoon pays out at 2:1, and Five Card Trick also pays at 2:1. Dealer wins all ties, including Five Card Tricks, even if the total value of the dealer’s hand is lower than the player’s hand. This version of Pontoon is a game that is easy on the eyes as it is to play. RTG went with a simple rule when designing this game – smooth and sophisticated. Everything looks clean and sharp, it’s easy to see what’s going on at all times, and the gameplay is extremely simple and intuitive. Subtle animations and flourishes keep the chips, cards, and menus alive. All the main buttons are grouped together at the bottom of the screen, off the table, to reduce clutter. The cards look great on the plush, green table, and are always easy to read so you know exactly what’s going on at all times. 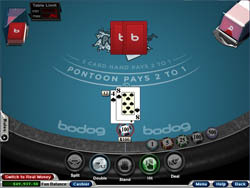 Because the dealer never peeks for pontoon in this game, when you are dealt pontoon, the round does not finish automatically. You still have the option to hit, stand, or double. Be careful of this! It is easy to get rolling, and hit on a natural pontoon, then go bust when you should have been paid out 2:1! Pontoon is a great all-around blackjack variant, and RTG has done a fantastic job with this version. The game looks and plays smooth, and the rules are easy to access if you need a reminder of what subtle differences make Pontoon a unique game. This is a good one to learn on – and actually, it’s a good one to stay with once you get used to the game!